As legend has it, director Joe Johnston fed the name "Rocket Boys" into a computer anagram program. The program rearranged the letters in every way possible. One of the combinations generated was "October Sky." This became the name of the movie. It's also an interesting coincidence. Not only do "Rocket Boys" and "October Sky" contain exactly the same letters, Sputnik was launched in October, and we actually see Sputnik streaking across the October Sky in the movie! October Sky has been released on two DVDs, each with different features. Available Audio Tracks: English, French. Available Audio Tracks: English, Spanish, French. Aiming High: The Story of the Rocket Boys, starring the real Rocket Boys. 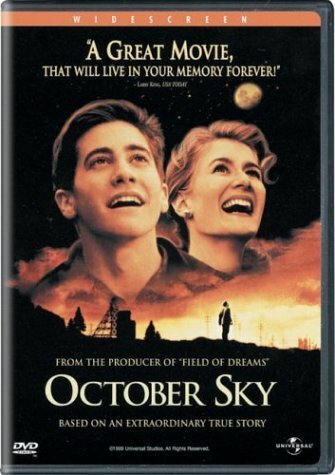 Feature Commentary with Homer Hickam. Personally, we like the 2005 Special Edition DVD the best. We would like to recommend that you first read the book and watch the movie (in whichever order you choose). After you've done that, take a look at "Aiming High" which has some interesting comments by Homer while he is actually in Coalwood. Finally, watch Homer's feature commentary on the movie. The commentary is fascinating and points out many of the differences between the book and the movie. 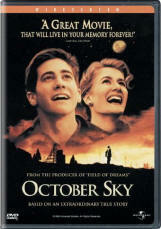 Click here to see the Internet Movie Database (IMDB) listing for October Sky. 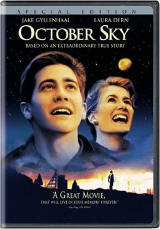 The Universal Pictures film October Sky was filmed primarily in East Tennessee around Knoxville, Oak Ridge, Oliver Springs, Petros and Wartburg. The filming took place in 1998. It was simply too difficult and remote to get the trucks and equipment into the real Coalwood (lack of airport, rental cars, hotels, restaurants, etc.) The producers chose east Tennessee for several reasons: 1) because of the easy access to Interstate highways, 2) there are locations that closely resemble southern West Virginia, 3) there are lots of hotels and restaurants nearby to accommodate the cast and crew. We have traced down several locations that were used for filming. As time allows, we are trying to get photographs of each location. Oliver Springs, Tennessee. This town was used for several scenes in the movie including downtown Coalwood, the Big Store and the Greyhound Bus scenes. Petros, Tennessee. This town was used for scenes which included the Coalwood tipple and the exterior of Homer's house. Wartburg, Tennessee. Scenes of the slate dump and Cape Coalwood were filmed here. Oak Ridge, Tennessee. The "removing-the-rail" scene was filmed here. Harriman, Tennessee. Many of the railroad scenes were filmed here. Knoxville, Tennessee. The downtown Indianapolis scenes (i.e., the national Science Fair and the movie theater Homer visited one night) were filmed here. In addition, all of the scenes of Big Creek High School were filmed in Knoxville.